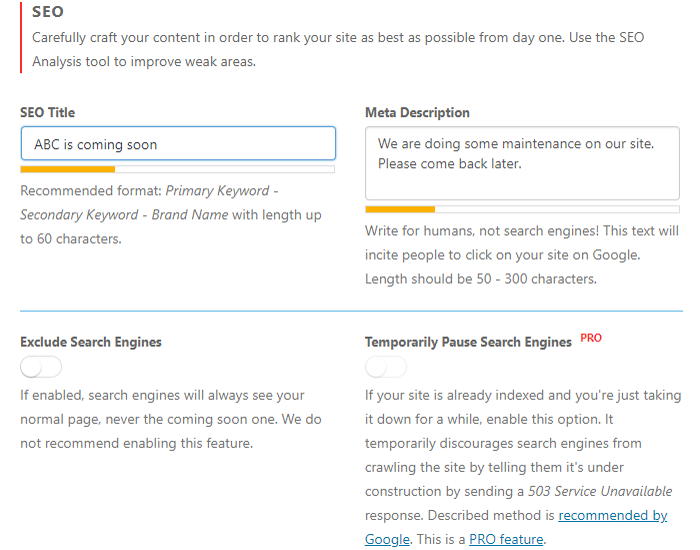 Maintenance pages are an integral part of any online website. The same is true for a WordPress website. It is common for owners to do maintenance or use a coming soon banner when they are planning a new iteration of new feature release. In both the cases, you will need a plugin to help you achieve the desired result. 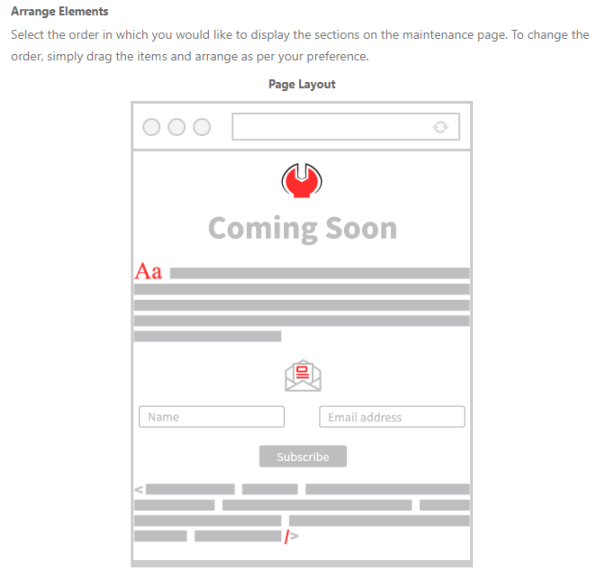 In today’s article, we will be using “Minimal Coming Soon & Maintenance Mode” plugin to show you how to create a maintenance page. We will also be reviewing the plugin alongside the tutorial. The plugin comes with both free and paid options. The free option gives you basic functionality whereas the “Minimal Coming Soon & Maintenace Mode Paid” gives you full control of the plugin. Apart from the tutorial, we will also be covering the plugin from a review perspective. So, without any delay, let’s get started. The installation process is simple and straightforward. All you need to do is go to your WordPress dashboard > Plugins > Add New > Search Plugins. Then search for the plugin name and click on install as shown in the image below. Once installed, you can now access the plugin by going to “Settings” > “Maintenance Mode. 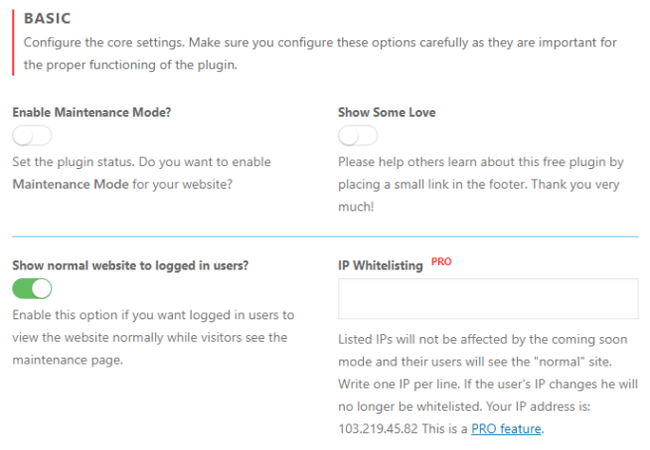 Once you are in the plugin, now, you can enable maintenance mode by toggling one simple button. However, we don’t encourage you to do so. In the basic page, you will a host of options to play with. 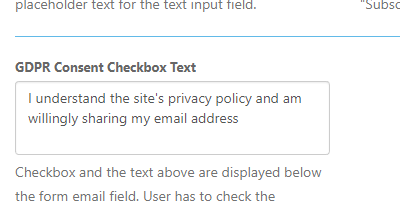 For example, you can change the header text, content, anti-spam text and so on. You can also arrange elements. Let’s see them below. The extra modules are only available to the pro version. 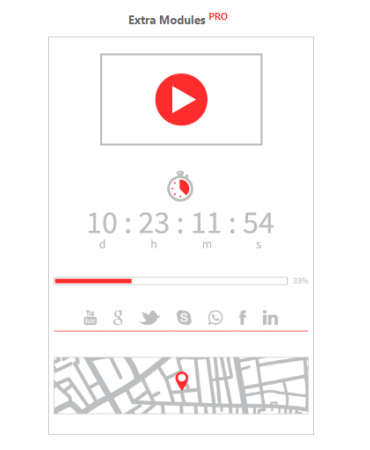 Here you can add more modules to the maintenance/coming page such as video, countdown, progress bar, social icons, maps and so on. You can customize each section by clicking on the desired section. For example, click on the “logo” to change it. 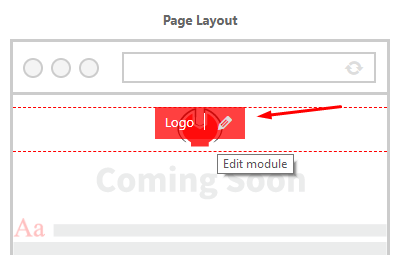 Once you click it, you will be redirected to the design section where you can do more stuff related to the design aspect of your page. For example, you can toggle the content overlay option, background image filter(PRO), content width, background color, content position, alignment, content animation and so on. 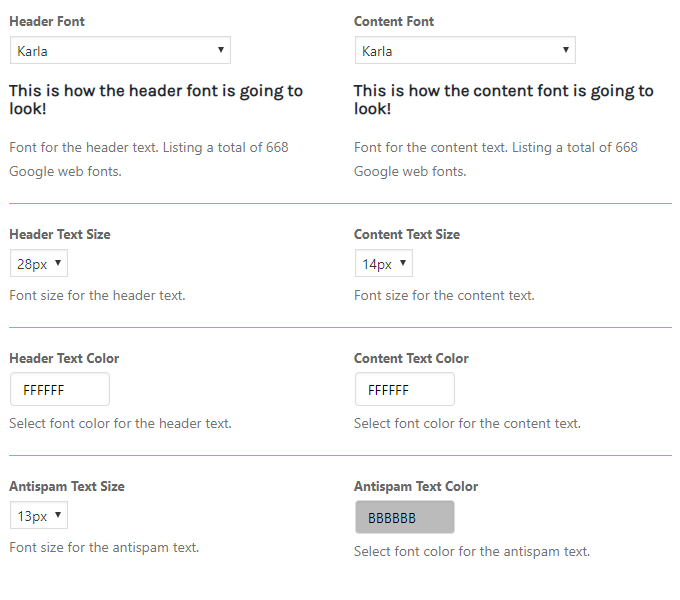 You can also choose the font type, family and size. In this way, you can customize every section of the page with more precise control. The plugin comes with the option of selecting a theme. 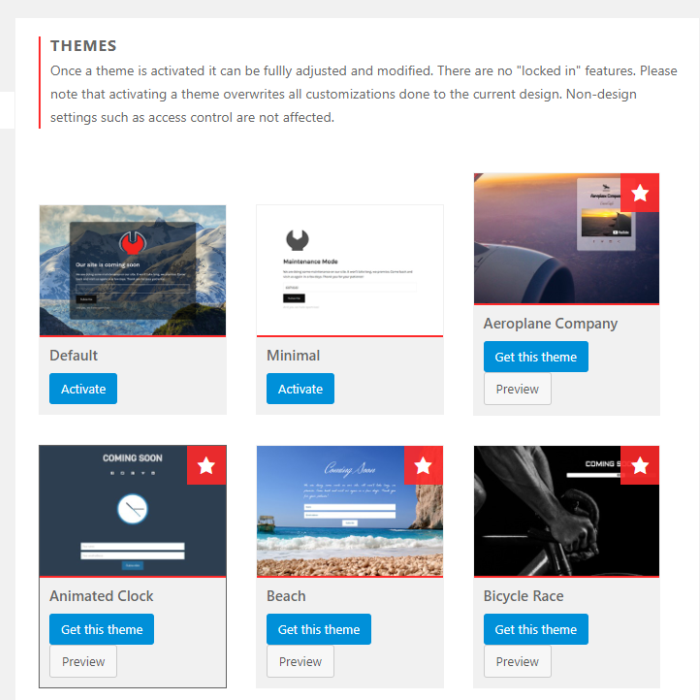 Themes let you have a good starting point. Also, they give you the option to customize as much as you want. The themes section looks like below. In free mode, you only get two free templates/themes. To unlock other themes, you need to use the PRO version. The GDPR policies need to be followed if you want to run your website online. The good news is that the plugin comes with GDPR consent checkbox text. 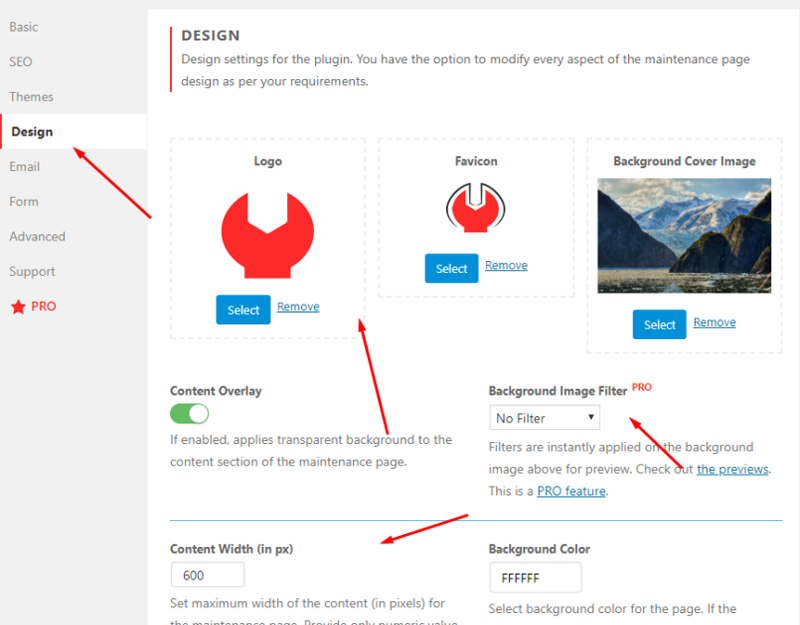 Once you customize your page, all you need to do is enable maintenance mode by going to the Basic section of the plugin. However, before you do, you can also add custom HTML and CSS to further customize it. Before you hit the publish button, you would also want to check the SEO section of the plugin. This is where you can properly do the SEO of the page by adding SEO title, meta description, Google analytics tracking ID, and so on. You can also exclude search engines or temporarily pause search engines. The plugin offers tons of features. Let’s list them below to get a better idea. 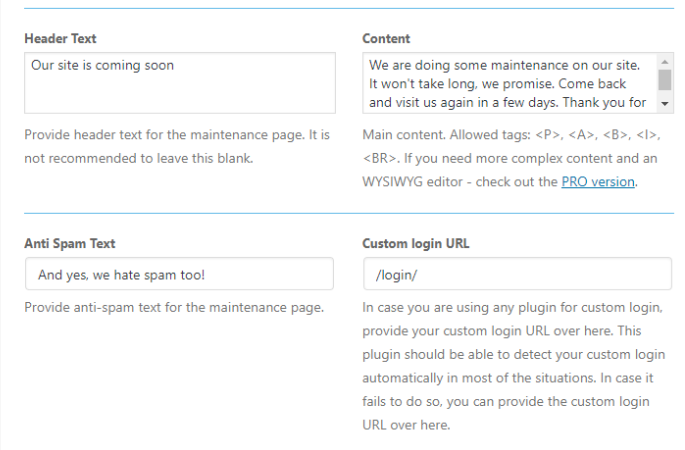 We surely recommend the plugin to anyone who is looking to create a modern, feature-rich maintenance page on WordPress. If you are confused, we recommend you to try out the free version before getting the PRO version. So, what do you think about the plugin? Comment below and let us know.